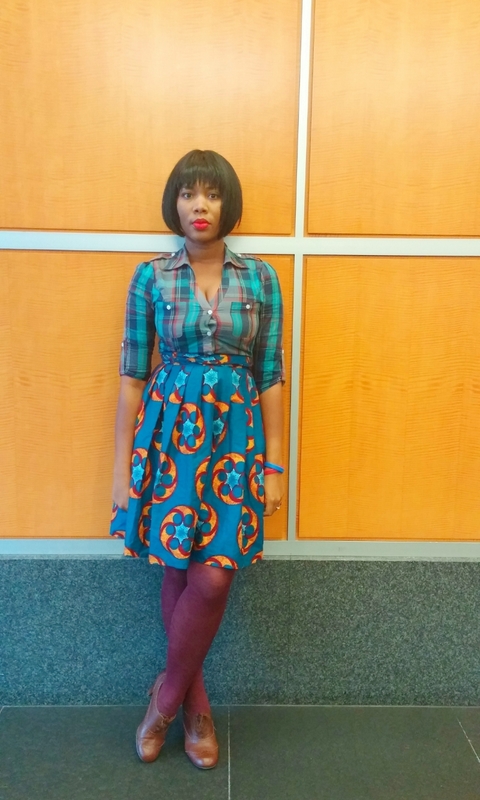 "There's a serious print war going on here with this plaid shirt and ankara skirt. I tried to make it as peaceful as possible by wearing similar colors (blue in this case) and wearing tights as opposed to fishnet. I know this (ankara + plaid) is too much for some folks but I couldn't resist trying it out. Once an idea gets into my head I have to act on it asap or else I'll go crazy. That's what led me to dye my hair pink once - a story for another day perhaps. Anyway, I have a feeling this combo will look better without tights. I'll try that out on a warmer day. For now, I'll keep searching for that perfect plaid, ankara and tights combo. This is the best I could do with what I had in my closet and I think it's great - for now."